possible double top, rebound may have failed. Van Tharp talks about a trading business plan. He has a full section on disaster planning. Two brokerage accounts, an internet back-up (like tethering your cell phone) and having the brokerage phone numbers handy. The big problem is if it gets truly ugly they will shut down the exchanges using the predetermined levels, like what happened election night a year ago. "McConnell says the Senate will vote later today on the Motion to Proceed to the GOP tax reform bill." yup using TRANSports.. to "hold" up the indexes..be very very careful. fehro wrote: yup using TRANSports.. to "hold" up the indexes..be very very careful. ok boss, am awaiting your next "dabble"
There are a lot of models for the Cboe’s VIX. None of them are particularly good at predicting what the VIX will do tomorrow but they can be useful in predicting general behaviors of the VIX. The most popular model for the VIX (although people might not recognize it as a model) is simple mean reversion. Car gas mileage is a good example of a simple mean reverting process. 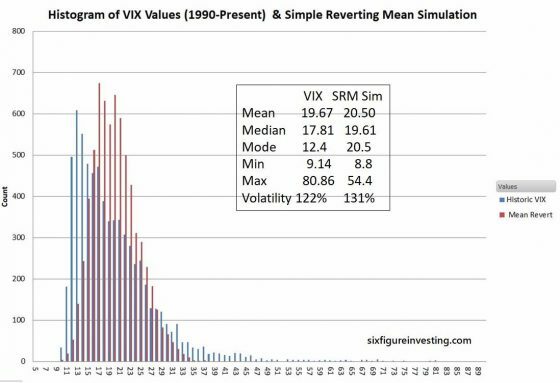 A mean-reverting random walk is a relatively simple model and fits some of the basic behaviors of the VIX. Specifically, over time the mean value of the VIX has stayed stable at around 20 and the VIX exhibits range bound behavior—with all-time lows around 9 and all-time highs around 80. However, there are many aspects of the VIX that aren’t well explained by a simple mean-reverting model. For example, a simple mean reverting process will have its mode value (the most frequently occurring values) close to its mean. This is not the case of the VIX; its mode is around 12.4—a long way away from its mean. The histograms below show that difference visually. Looking at FINVIZ.com it is real clear that what ever was selling stopped at noon. Interesting that the foreign indexes were similarly hit. Also the dollar stopped dropping and the VIX stopped rising. Bonds sure didn't show any pattern that I could see. I am sure it will all be explained tonight by the media. Now we will be subject to an absolute barrage of articles by the permabears about this warning. I personally will consider them to be balderdash, as clearly there was a cause for today's action and all it showed was what we already knew. The geniuses in Washington have eliminated market makers and pretended that high speed trading firms would provide liquidity when they have proven time and time again that they just switch off. The real warning is that when the major event happens it will be as it always has been for us retail types, no access to the markets. Only real protection in my opinion is a defensive options hedging strategy because with these new highs all the relatives think they are can't lose smart and won't take any profits. Sigh. Sorry wasn't clear. Trying to convince family members to hedge at this point seems the only possible thing to do because they sure won't listen if you say time to take profits. So what, you don’t buy car insurance because you’re certain you’ll never get in a car crash?